Azure Databricks is a fast, easy, and collaborative Apache Spark-based analytics service. For a big data pipeline, the data (raw or structured) is ingested into Azure through Azure Data Factory in batches, or streamed near real-time using Kafka, Event Hub, or IoT Hub. This data lands in a data lake for long term persisted storage, in Azure Blob Storage or Azure Data Lake Storage. As part of your analytics workflow, use Azure Databricks to read data from multiple data sources such as Azure Blob Storage, Azure Data Lake Storage, Azure Cosmos DB, or Azure SQL Data Warehouse and turn it into breakthrough insights using Spark. Dynamically autoscale clusters up and down, including serverless clusters, and share them across teams. Use clusters programmatically by using the REST APIs. Use secure data integration capabilities built on top of Spark that enable you to unify your data without centralization. Get instant access to the latest Apache Spark features with each release. 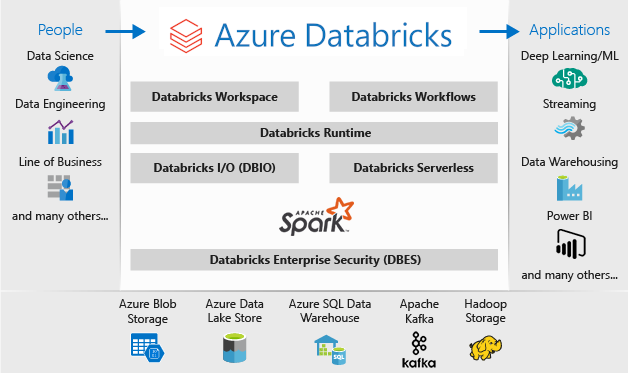 The Databricks Runtime is built on top of Apache Spark and is natively built for the Azure cloud. With the Serverless option, Azure Databricks completely abstracts out the infrastructure complexity and the need for specialized expertise to set up and configure your data infrastructure. The Serverless option helps data scientists iterate quickly as a team. For data engineers, who care about the performance of production jobs, Azure Databricks provides a Spark engine that is faster and performant through various optimizations at the I/O layer and processing layer (Databricks I/O). Through a collaborative and integrated environment, Azure Databricks streamlines the process of exploring data, prototyping, and running data-driven applications in Spark. Determine how to use data with easy data exploration. Document your progress in notebooks in R, Python, Scala, or SQL. Visualize data in a few clicks, and use familiar tools like Matplotlib, ggplot, or d3. Use interactive dashboards to create dynamic reports. Use Spark and interact with the data simultaneously. Azure Databricks provides enterprise-grade Azure security, including Azure Active Directory integration, role-based controls, and SLAs that protect your data and your business. Integration with Azure Active Directory enables you to run complete Azure-based solutions using Azure Databricks. Azure Databricks roles-based access enables fine-grained user permissions for notebooks, clusters, jobs, and data. Azure Databricks integrates deeply with Azure databases and stores: SQL Data Warehouse, Cosmos DB, Data Lake Store, and Blob Storage. Through rich integration with Power BI, Azure Databricks allows you to discover and share your impactful insights quickly and easily. You can use other BI tools as well, such as Tableau Software via JDBC/ODBC cluster endpoints.